Integration hub | What’s in a name? What our names can tell us about how integrated ethnic minorities and our neighbourhoods are. Have you ever considered what information your name and address conveys to those you come in contact with? To organisations that have mastered the art of analysing “big data” your name and address is laden with potentially useful information. That I use “Mr” as a salutation gives a clue to my gender. So too does the fact that my parents named me “Richard”. On average people named “Richard” are ten years younger than those named “Roger”. Roger, my brother, is nine years my elder. My postcode, N6 6DJ, may mean little to you but to consumer facing organisations it places me in the classification “Liberal Opinion”. Based on the number of “remain” posters in our street’s windows, this seems an accurate assessment. That my surname is “Webber” rather than “Weber” suggests that my forebears originated in Somerset or Devon, not Germany, which is the case. Even today your neighbour is 30 times more likely to be called Webber if you live around Taunton than if you live near Aberdeen. So, if names are useful markers of the region of Britain where your forebears came from, how much more useful a marker are they of the country in which your forebears lived, the language that they spoke or the religion that they practiced. We associate Wolfgang with being a Christian name, used by German speakers and specific to Germany and Austria. Let’s say we know the names and postcodes of all (or virtually all) adults who live in Blackburn. If we associate each name with a religion and then map the percentage of people in each postcode who have a Muslim name, we immediately see the geographical spread of people with Muslim names and in considerable geographic detail. Admittedly some names may be incorrectly associated and some people may have changed religion. Only a pedant would challenge the contention that this map gives an accurate indication of where people with a Muslim cultural background live in Blackburn. 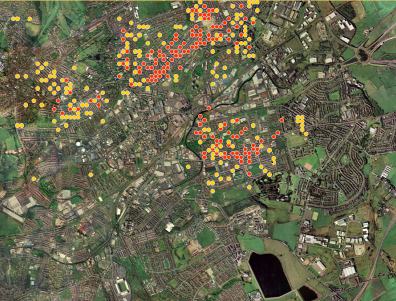 Figure 1: Blackburn Lancashire – the red dots indicate streets with over 75% Muslim names. Yellow dots have over 50% Muslim names. Why might such a map be “useful”? No doubt for targeting products and services, for adapting communications content, for siting shops and deciding what to stock in them, for political campaigning and door to door canvassing, activities which otherwise rely on statistics from the decennial census. The benefit of names is that they offer more granular and relevant categories than the census (Turks rather than “white other”), more granular geographic resolution (postcodes rather than the cruder census output areas) and statistics that can be updated each year. Recency of data is an issue given the rapid growth of Britain’s non-white population and that census statistics are anything up to twelve years out of date. Using names we may find it useful to classify postcodes, and hence the people who live in them, according to the (non-white British) cultural group which is the largest in the postcode (or street). Questionnaire responses from YouGov demonstrated that people with Hindu Indian names who lived in predominantly Hindu Indian postcodes were much more likely to support Labour than people with Hindu names who lived in predominantly white areas. 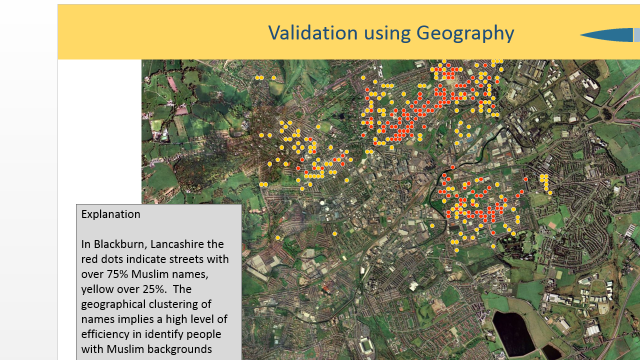 By contrast it would seem that Muslims living in postcodes where Muslim names form the largest group are less vulnerable to radicalisation than Muslims living in neighbourhoods where other minorities dominate. Consider for example a person with a Greek Cypriot first name, a Greek Cypriot family name and living in a street where a higher proportion of residents have Greek Cypriot names than any other category. We can begin to move from a single dimension of ethnic classification – which group do you belong to? – to a two dimensional classification, the group you belong to and how strongly you are likely to be associated with it. In other words we can begin to associate individuals with not just a cultural background but with how strong an influence that background is likely to have. Figure 2: Proportion of persons from different cultural backgrounds with a first name that is white British. Another way of using names to understand cultural assimilation is to track the proportion of people with surnames from different cultures that have white British personal names. Taking a file of virtually all adults in the UK, it is not surprising to find that people with Black Caribbean, Jewish or Maltese family names are the most likely, after the white British, to have been given white British personal names. Turks and Greek Cypriots lie approximately half way down this ranking. 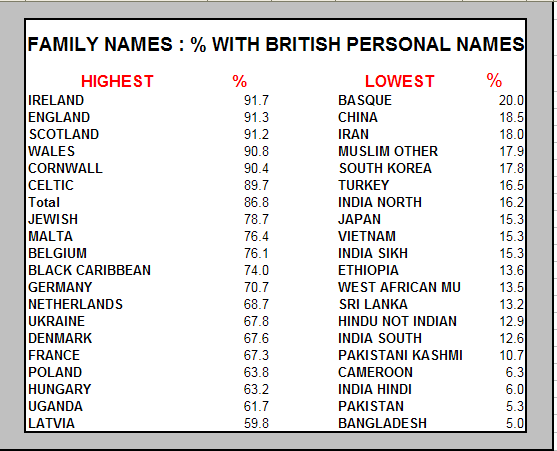 Groups which are the least likely to bear white British personal names are people with Bangladeshi, Pakistani and Sikh Indian family names and, within those groups, people who live in postcodes such as those in Blackburn and Oldham where South Asians form the largest group. The different positions of different groups on this measure help to give meaning to the concept of “cultural distance”. 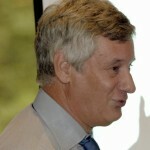 People from cultures which differ from the UK’s indigenous population in terms of religion, language and customs might reasonably be expected to be among those that defend their culture most actively and who are least likely to find a partner, let alone a compatible one, from among the majority population. Or so one might suppose. Taking the simple combination of personal and family name, maybe we can create a proxy for cultural distance both by ethnic group and, within ethnic groups, by part of the country. Data of this sort are just as relevant to the geographic analysis of segregation. Though London has hugely more people of non-British origin than provincial England, most Londoners from minority communities do not live in postcodes dominated by their own community, with the exception of Tower Hamlets. Neighbouring Newham is the most striking example of diverse rather than mono-ethnic streets. Outside London members of minority communities are far more likely to live with immediate neighbour from their own background. We believe these differences must have a major impact on the trajectory of assimilation both locally and nationally.